Only ten tracks on each disc, a very short running time, and no new material whatsoever. Yet I recently bought the two "new" Camden CDs I Got Lucky and Elvis Sings Hits From His Movies Volume 1. I have written about my reasons earlier, when I added Burning Love And Hits From His Movies and Separate Ways to my collection last year. It all boils down to fond memories and nostalgic reasons, I guess. But, listening to Elvis Sings Hits From His Movies this week, I couldn't help thinking that this must be one of the worst Elvis album ever. 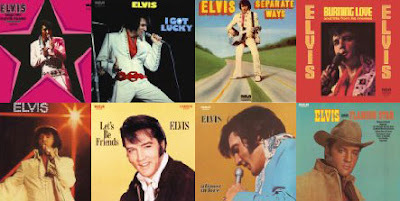 Not only is the title downright misleading (there are no hits on it, just a mishmash of old movie songs), but it also includes some of the weakest material ever recorded by Elvis ("Confidence" and "Old MacDonald"). What's more, the album only has eight movie songs on it, the last two tracks being bonus songs, the studio cuts "Guitar Man" and "Big Boss Man." Granted, these two are the strongest of the bunch, but that didn't help save the day. The album only reached the 87th chart position in the US back when it was originally released in 1972. Maybe not very surprisingly, the record stores started returning Camden records in huge quantities about the same time. The Colonel's solution? Another album in the same vein, only this time coupled with Elvis' new hit single "Burning Love"/"It's A Matter Of Time." That one, Burning Love And Hits From His Movies, reached number 22 a couple of months later, selling nearly a million copies. The Colonel must've been pleased. I wonder what Elvis thought about it? Elvis In Demand Vol. 2? "Together they burn up the screen"